The Co-operative Insurance Cup is no more, with the competition being known as the Scottish Communities League Cup for next season. A new £1m, one-year package, announced by First Minister Alex Salmond, is part of the Scottish Government's programme of investment in football. So Rangers, who beat Celtic on Sunday, will defend a trophy now sponsored by cash seized from criminals. CIS had been the sponsor since 1999, but that deal has now drawn to a close. And the Scottish Government, having previously sponsored the Scottish Cup for two years, has stepped in to bridge the gap. But it was only able to commit to the League Cup for one season because of the pending Scottish Parliamentary election. The £1m funding from the Proceeds of Crime Act will be used in partnership with the Scottish Football League to deliver increased opportunities in sport and physical activity for young people through local football clubs. It will also provide greater support to clubs to work with their local community to address alcohol misuse, sectarianism, racism, domestic abuse and violence. The package is part of the Scottish Government's wider programme of investment in football and is in addition to the £40m previously committed to CashBack for Communities projects since 2007. However, the new sponsorship deal is a direct result of the recent Old Firm summit, called by Salmond following a volatile Scottish Cup replay encounter between Celtic and Rangers on 2 March. Salmond said it was agreed after the first meeting of a joint action group, which was set up to deliver the eight-point plan to improve Scottish football. "The Scottish Communities League Cup strengthens the commitment made at the recent football summit to support the expansion of existing community and social partnerships and back clubs, authorities and police in tackling alcohol misuse, sectarianism, racism, domestic abuse and violence," suggested the First Minister. "Everyone involved in the summit was determined that the positive ideas would be turned into action and here we are, less than a fortnight since the summit was held, announcing a major step forward for Scottish football. "However, there is much more to be done and all parties involved are committed to delivering the proposals and securing a bright future for our budding footballers." In return for the sponsorship, the SFL will encourage its clubs, coaches and players to strengthen their involvement with local communities and schools. Clubs will also examine ways of opening their facilities to the local population, while tickets for all League Cup matches will be targeted at young people and families. "The Scottish Football League and our clubs already carry out a lot of valuable work in supporting local communities, while the previous sponsor, the Co-operative Insurance, has left a lasting legacy that we are keen to build on," said Salmond. SFL chief executive David Longmuir hoped that there would be a spin-off for the whole of Scotland. "The SFL occupies a unique position within the hearts and minds of not only the football supporter but within the wider Scottish community," he said. "The SFL and Scottish football will now work closely with the Scottish Government to make sure we deliver an exciting and engaging programme of activity around the Scottish Communities League Cup, which we hope will inspire the nation." 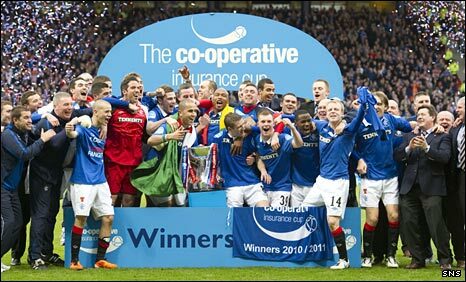 Co-operative Insurance was the fourth commercial sponsor of the Scottish League Cup, previous support coming from Bells between 1979-81, Skol from 1984-93 and Coca-Cola from 1994-98.